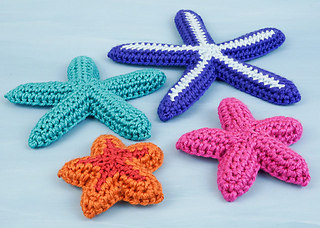 Starfish Collection is a mix-and-match no-sew pattern that includes 4 sizes of sea stars, ranging from 3 to 7 inches (7.5 to 18cm) across. 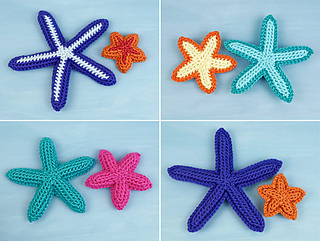 You can make each size in any of three colour patterns (plain, striped top, and pale underside). 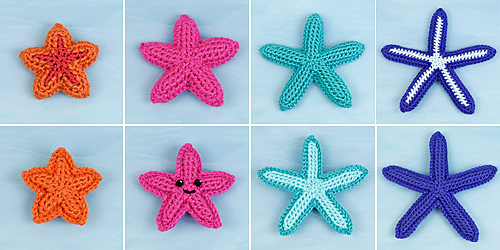 The pattern also includes flat appliqué versions, and instructions for making amigurumi-style starfish with a cute happy face! 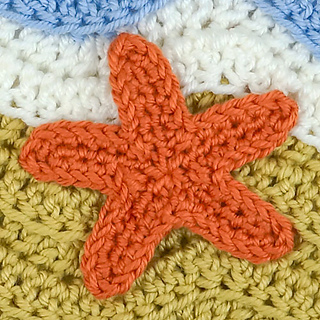 Choose size, pattern, colour(s), flat or 3D, and whether it has a face - you can mix-and-match endlessly to make new combinations. 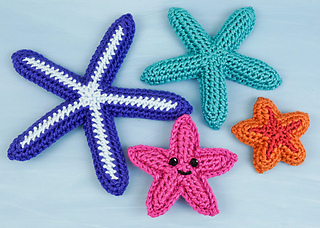 Choose whites and pale neutrals to decorate your home with an elegant seaside vibe, or make colourful smiley toys (as they are made in one piece, they’re perfect baby-safe toys too, with embroidered or no features). 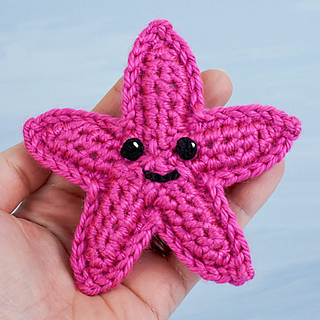 Details: Starfish Collection includes written patterns, general step-by-step photo tutorials for all the starfish, and right- and left-handed stitch diagrams for every size. 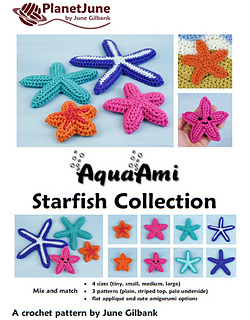 This is a modular pattern, so you can save paper and ink by reading all the background tutorial information on-screen and just print the pages you need for the written instructions (p6-8) and stitch diagrams (right-handed p10-12; left-handed p14-16).